Is your child picking up more than the ABC’s in school? While you’re packing your child’s backpack with the pencils, notebooks and tools they’ll need for a great school year, don’t forget the supplies they’ll need to stay healthy and germ-free, too. With nearly 22 million school days lost each year due to the common cold and flu (CDC) and as many as 2.7 million bacterial found per square inch on common school surfaces (NSF International), it’s no wonder that 82 percent of parents with kids in grades K-5 fret about the germs in their children’s classrooms (according to a survey conducted by Seventh Generation). Sixty percent of teachers surveyed said that they request that parents donate disinfecting wipes to the classroom. Seventh Generation’s disinfecting wipes kill 99.99% of germs* naturally using the active ingredient thyme, a component of thyme oil which is derived from the herb thyme. I LOVE Seventh Generation. Simple & clean - no worries about toxins or chemicals. And the smell is fresh and clean nothing perfume - y. 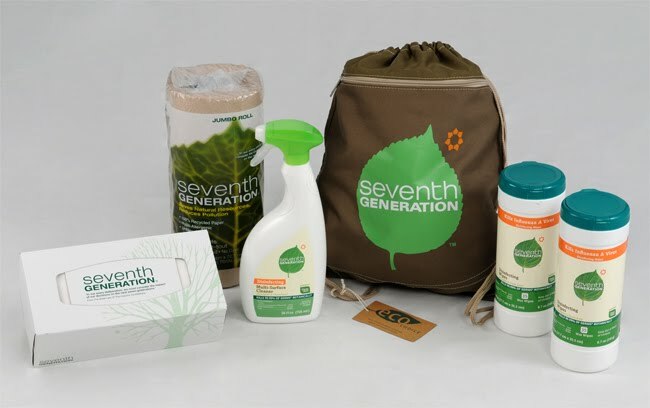 One lucky winner will receive the Seventh Generation Back To School Prize Pack pictured above!! *Follow me @jamaise at Twitter & Tweet this : RT @jamaise #GIVEAWAY #WIN - a Seventh Generation Back To School Prize Pack http://bit.ly/91AOGa Ends 8/16 tweet each day for one entry each ! Washing my hands is a must! I also try to take a good vitamin and load up on vitamin C if I find myself getting sick. using your arm to cover your mouth when you cough/sneeze. and of course, hand washing! Take vitamins everyday and extra vitamin C in the winter. I try to keep regular meals and regular sleep. Sometimes it's not so much the germs as it is a weakening of your systems, especially when you've lolled around all summer with less stress. I am entered into the Simply Organic giveaway! We wash our hands alot, have hand sanitizer, I wash the door knops, light switches, and handrails every few days. My son got H1N1 last October from the pumpkin patch's jump house thing(we know this cause he doesn't go to daycare or school, and we didn't do play dates), so I'm kinda freaking out about flu season again especially since my son may be in preschool this year. Eat healthy and get lots of exercise. The healthier you are the easier to fight off germs. Wash hands and don't touch your face. Germs from hands can infect through your nose, mouth and eyes. We wash our hands every time we come home. I make sure that we get plenty of vitamin D (this is proven to help fight the flu). We will be getting the flu shot this fall, because H1N1 can be very dangerous. We are just very careful with good hand washing. I am a former nurse...in my opinion, nothing trumps hand washing. I make sure to wash our hands frequently. I know that's what everyone else said, but it's true! Thanks for the giveaway. I explain to my kids how important hand washing is and try to tell them to use their own pencils - etc. Entered your Hello Mellow Body Butter giveaway! Entered your face brush giveaway! Entered your simply organic giveaway! Entered your happy heineys giveaway! I keep an hand sanitizer by the front door for easy hand cleansing reminders. I'm a friend. We try to avoid large crowds during cold & flu season. You can't wash your hands too much - well not really. washing hands!! and... taking a multivitamin daily to keep or defenses up! We try to wash our hands often and keep our immune systems up by eating well and sleeping enough. I entered the Tropical Traditions All Purpose Cleaner giveaway. I am a GFC blog follower and I always make sure there is tissue at our house and hand soap at every sink. always make sure to cover your mouth when coughing or sneezing, and wash your hands constantly. We also take supplements to boost our immune systems. Washing hands is crucial. I think that's even the most important thing! I keep hand sanitizer in my car so my kids can clean up after touching things whereever we go. My kids also take a multivitamin and vitamin C EVERY DAY! It's a habit! They don't leave the house without taking their vitamins! public follower on google friend connect! retweeted: RT @jamaise #GIVEAWAY #WIN - a Seventh Generation Back To School Prize Pack http://bit.ly/91AOGa Ends 8/16 tweet each day for one entry each ! I teach my kids good hygeine. Wash hands , cover your mouth with arm not hand when u sneeze.ect. Washing our hands every time after they play outside or before eating, and after going to the bathroom! I commented on seventh generation's fb wall with a link to this giveaway. befriended you you on FB liked you and Put in my status that Wishing Penny is a good way to keep your kids germ free though the school year i also tagged you in it!! I am a friend of Seventh Generation on FB!! liked Seventh Generation on FB if they indeed are 2 different pages! !